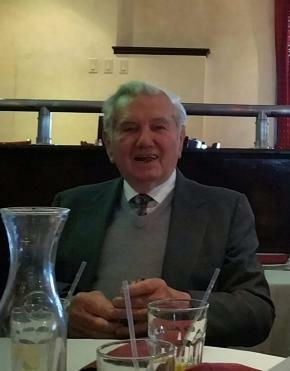 Gerhard A. Scholz 89, of Lyndhurst, NJ passed away on Monday July 16, 2018. Born in Liegnitz Schlesien, Germany he immigrated to the United States in 1957 eventually settling in Lyndhurst 54 years ago. He was a very active member of the Church of God in Midland Park. An avid woodworker, he enjoyed gardening and reading, but most importantly he was a passionate family man who enjoyed spending time with his family especially his grandchildren. Prior to retiring, he was a carpenter for 60 years. Beloved husband of 63 years to Martha (Jaeger) Scholz. Loving and devoted father of Jutta Braun and husband Manny, Doris Florczynski and husband Norbert and Ellen Braun and husband Willie. Cherished grandfather of David, Eric, Kimberly and Tyler Braun, Mark Florczynski, Erin Wilson and husband Dan and Chelsea Soliman and husband Josef. Adored great grandfather of Logan Wilson. A memorial service is planned for Sunday July 22, 10:30 AM at the Church of God, 400 Godwin Avenue, Midland Park, NJ 07432. In lieu of flowers, donations in memory of Gerhard may be made to St. Jude Children’s Research Hospital, PO Box 1000, Dept 142, Memphis, TN 38148 or the Church of God, would be greatly appreciated. My heartfelt sympathy to the whole family. Gerhard was a very kind, gentle and caring person. The last time I spoke with him was at my Dad's funeral. He was always very social :) May God's love and peace surround each and every one of you as you go through this difficult journey in life. Each week after service I was sure to receive a heartfelt greeting,, words of encouragement and and a firm hand shake. Such a wonderful man Who will be missed. My condolences to his beautiful family. I offer my deepest condolences for the loss of your father, my friend. Your father was a great person and a superb mentor to whom one would always look forward to. I hope you have all the strength to cope up with the loss.